Originally known as the Ashtabula County Nursing Home, the Ashtabula County Nursing and Rehabilitation Center has been serving the people of Kingsville and the surrounding areas since 1841! Over the years, we have grown and evolved to meet the changing medical needs of our community. 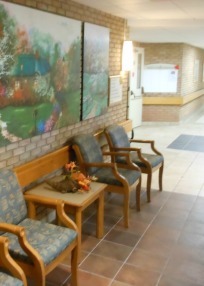 We are currently a state-of-the-art facility offering long-term care, skilled nursing and therapy services. We employ 135 people, making us one of the larger employers in the county. We are also proud of the additional services that we can provide as a result of our partnership with DaVita Dialysis. The Ashtabula County Commissioners praised the facility stating, "Over the years, its directors and staff have literally kept their fingers on the pulse of the community and have responded to its medical needs by giving quality care to the residents of the facility." We are proud to be a part of this community and welcome the opportunity to serve you and your family. Please Contact Us for more information.